Blount County Animal Center receives $30,000, equipment donation to perform lab tests on-site. 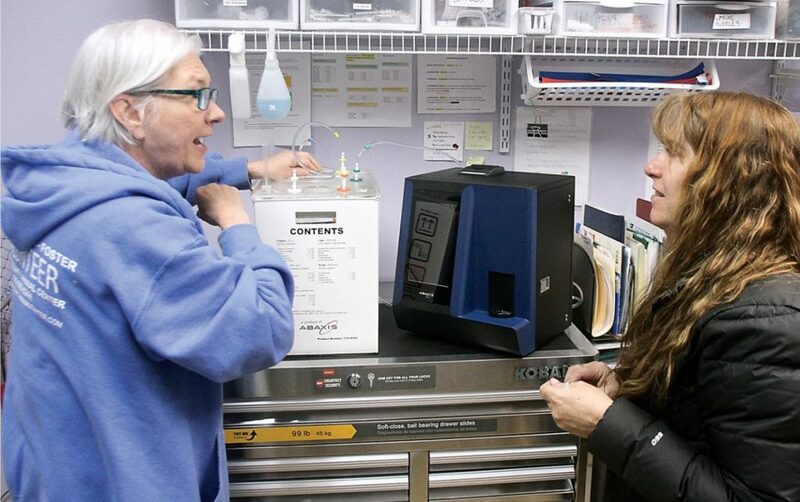 Paula Hargis with Zoetis Abaxis helps Roxanne Stephens learn how to change tubing on one of the new machines provided by anonymous donation through the Smoky Mountain Animal Care Foundation. The Blount County Animal Center will be able to perform lab work on-site. Thanks to a generous anonymous donation, the Blount County Animal Center has two state-of-the art pieces of medical equipment to better care for shelter animals. The equipment, valued at $30,000, allows the BCAC to perform lab tests on-site instead of sending blood samples to the University of Tennessee College of Veterinary Medicine, said John Nichols, treasurer of the Smoky Mountain Animal Care Foundation. SMACF provides the funding for a veterinarian at BCAC, as well as covers other expenditures. The equipment donation was made through SMACF. “This is a significant step up for the center, allowing the staff veterinarian to complete full blood work-ups on-site,” Nichols said. One of the machines analyzes hematology, providing a complete blood count (CBC) that is used to evaluate overall health and detect a wide range of disorders, including anemia, infection and leukemia, while the other equipment checks blood chemistry by screening different organs. That piece of equipment measures blood chemistry and electrolytes. It can determine the health of organs such as kidneys and liver function. Lab results can be ready in as little as 12 minutes. The donation was done in memory of a dog, Babe. She was rescued from a shelter and was a beloved pet. Dr. Michelle Williams is the veterinarian on-site at BCAC. She said these tests are performed on animals that appear sick. The tests can determine if a dog or cat is anemic or has high white cell counts — a signal of possible disease. In the past, the animal’s blood was drawn, and a courier had to take the sample to UT, Williams said. In addition to providing funding for Williams’ salary and those of a part-time vet tech and assistants, SMACF also supports a free monthly spay and neuter clinic for cats. In 2018, 350 cats were spayed through the effort. Funding for all spays and neuters conducted on the shelter’s animals is made possible by SMACF and totaled 2,500 surgeries last year, said SMACF President Diane Martin. “We also provide funding for the medical supplies used on surgery, as well as for the many advanced procedures and tests that exceed our equipment or surgical capability,” Martin said. It also funds an animal transport program where shelter animals here are taken to such states as Minnesota and New York, where there is a shortage of adoptable animals. Williams expressed interest in attending an upcoming conference at Cornell University on improving the quality of care for shelter animals. SMACF will fund that as well. SMACF relies on donations to make all of this possible. Martin said the group hasn’t had a major fundraiser since the Fur Ball in 2008. On April 28, Blount County can lend its support by attending the Ales ands Tales at Round 6 Brewing in Maryville, officials said. Smoky Mountain Animal Care Foundation will hold its Ales and Tails fundraiser from 4 to 7 p.m. on Sunday, April 28 at Round 6 Brewing, 427 Whitecrest Drive, Maryville. There will be food, drinks, door prizes and a silent auction. Pistol Creek Catch of the Day will provide the music. Tickets are $40 in advance (available at Vienna Coffee House, 212 College St., Maryville, Round 6 Brewing and Blount County Animal Center, 233 Currie Ave., Maryville) or $50 at the door. Purchase tickets online at https://squareup.com/store/smacf. Spaying and neutering is broadly recognized as the best way to avoid unwanted pets, and to work toward ending pet overpopulation. Just one female cat can potentially give birth to 180 kittens during her lifetime. Depending on the breed, the numbers for puppies may be even higher. In addition, spaying and neutering can provide certain health benefits, such as reducing the incidence of several types of cancers. Tennessee state law requires spaying and neutering of all adopted animals. Every animal adopted at Blount County Animal Center is spayed or neutered before going home, or returns to the shelter once old enough for surgery. During 2018, over 2,300 animals brought to the shelter received spay-neuter surgeries. Held approximately once a month, the CatSnip Program offers free surgeries for pets belonging to Blount County residents. Last year, about 350 pets participated in this initiative. For repeat visitors to the shelter who surrender a litter annually, the shelter also offers to spay the mother, in order to ensure her health, and to prevent future unwanted litters. The Smoky Mountain Animal Care Foundation is a non-profit partner dedicated to funding expenses at Blount County Animal Center, including spay-neuter costs. As a non-profit, SMACF seeks funding through grants from organizations like Petco and PetSafe. The ability to provide medical care for every animal that enters the shelter is possible because of the generosity and support of groups that recognize the importance of animal welfare.